This week, Atlas presents a new format for Matt Magee: An Interview. I became aware of Magee’s work a few years back and when Hiram Butler Gallery presented Circa 1994 in 2013, I was swept away by Magee’s imagery and Josh Pazda’s catalog essay (full text after interview below or through this link). In this interview, I aim to ask the questions I would ask on a first time studio visit. While this is primarily about the studio space and practice, Matt’s keen intellect and sense of wonder in the world become quickly evident. The breadth of the Magee’s work can be seen at his website and at the Hiram Butler Gallery page for the artist including a brief video interview with the artist about his last exhibition. I hope you enjoy reading the interview as much as I enjoyed being part of it. Many thanks to Josh Pazda, Hiram Butler Gallery and an oversized thank you to Matt Magee. I look forward to the next interview with Matt which I hope to time with the artists show at James Kelly in Santa Fe, NM (Sept 5 – Oct 25, 2014). JB: First off, would you mind showing me your studio right now (by sending a picture perhaps)? What do you keep around you? Can you describe some important practical materials and your visual environment? MM: Every studio I’ve ever had in Brooklyn (Bed Stuy for 20 years! ), Manhattan and now here (AZ) has had this sort of installation of small objects, paintings, things I find etcetera, I’ve been schlepping some of the same objects and small sculptures from studio to studio to studio and am hard pressed to sell them, they are talismans sort of, they hold memory of place. Things in rows! I am constantly putting things in rows. My father was a geologist and archaeologist and his sense of order was imparted to me. I’ve always had rocks, seashells, bits of coral, arrowheads, crystals et al around to look at. Important practical materials are a good selection of oil colors for carrying out my practice and a selection of wood panels of all sizes so I can use whichever whenever suits my needs. I’m in the desert and can hear birds outside, all my doors are open, the air is blowing through. Completely obverse to Brooklyn where I was behind 3 maybe 4 doors, no windows, usually cold. I’ve always had a big work table, have always painted flat on the table, with oil on wood panel and have never painted on canvas. I like the weight of the panel and can sand the surface easily if a painting needs to be destroyed. Paintings are mapped out first in pencil, and completely drawn out. JB: Is there an item you have kept in all of your studios over the years? MM: My sketchbook, not the same one of course, but the current one, with words and ideas. I write down words which are evocative to me of images; most recently somniloquy (sleep talk), I wonder what sleep talk would look like? Or corollary, what would a corollary look like? Or sometimes a work is completed and becomes suggestive of a word or title. JB: How do you choose to spend time in the studio? Do you find yourself working in bursts or is it always at the same pace? MM: I arrive studio and get to work, not much doodling, and almost consistently have an idea or project to work on. I tend to work at the same pace everyday, and like routine, and like consistency, and don’t like to waste time. I roll words around in my head searching for an image to fit that word, I tend to search in a pattern or sometimes a painting or object is made completely in my head, and just needs execution. JB: Do you sketch as well as record words and thoughts in your sketchbooks? Do you refer to them while painting? MM: I make thumbnails of ideas which sometimes but not always become paintings. And I definitely write down words. I also have three 5″ x 4″ pieces of cardboard with lists of words I like, written on both sides, that I’ve been carrying from studio to studio to studio for about 15 years now. I do not refer to the sketchbooks while painting. Once a surface is mapped out I paint it. JB: Do you feel as though the vocabulary you use is a two way communication? RE: Does it exist only to assist you in creating an image or are you also trying to get your viewer to decode your intentions? MM: It IS a two way communication but it’s not necessary that the viewer decode my intentions. I like enigma. JB: Would you like a viewer to find connections to your translation of a chart or an image born of wordplay or do you hope they will build their own associations? MM: Definitely build their own associations which I think any artist would want. I can easily explain the sources for a lot of the paintings but I’d hope of course the viewer would only use that as a starting point. JB: We have talked some about Rauschenberg and the art and materials you collect, but tell me about the other (non-art) influences on your work? Has your new home and landscape changed things much for your work? MM: Geology, archaeology and how artifacts are displayed in museums has always been of interest. Reading is also an influence. Virginia Woolf’s novel ‘The Waves’ was the inspiration for ‘Greentext’, a painting that was in my last show at Hiram Butler. It came about both because of my memory of reading Virginia Woolf’s ‘The Waves’ and also, at one point (circa 1980) I was on a seismic crew on the border of Texas and Mexico. (Josh Pazda writes about this) I seem to have painted quite a few wavy line paintings over the years which could also refer to seismic waves. Also ‘Against Nature’ by Huysman, I think a lot about that all black dinner hosted by Des Esseintes, the image of it in my mind’s eye. And yes, the Arizona sky and landscape have definitely been an influence, some of my recent paintings can be seen as a series of receding horizon lines. One can see mountains on horizons here, the sunsets, distant lines and edges are visible. I’m aware now of water consciousness here in the desert. Another recent painting is ‘Deposit’ which can be seen as a grid with droplets of water stored in each quadrant. JB: I am a huge music fan. Do you listen to Music in the studio? How does it affect your day and your work? I listen to a variety of things in the studio but also go through hours and hours and hours of silence if my mood suits. The repetitious process in some of the paintings is given to a kind of meditation, a suspension in time and place if you will, silence makes it really rich. Otherwise I listen to the classical station on the radio because there’s no ads. And every now and then I listen to the radio on iTunes and especially like a station out of Paris, alternative new stuff. JB: One of my least favorite interview tactics is working in a famous quote (i.e. like Borges aphorism, and so on…) to get a response. I often want to have the interviewer simply ask what quote, notion or dictum the interviewee hold dear. So since I am the interviewer, if you would like to, please share something that matters to you. We move from moment to moment, mood to mood, making decisions that control our acts, insisting and recognizing that facts are changing like the light we are seeing them in and as our motivation to look. We are all unique. It is a precious thing to compare ourselves to nothing else. This is my working attitude. I do not feel shame in my joy nor regret or fright in history. Circa 1994 assembles a group of Matt Magee’s paintings executed nearly twenty years ago. The early 1990s marked a shift in Magee’s oeuvre, from a predominantly sculptural practice to a painterly one. It was at this time, too, that the artist developed a visual vocabulary in earnest and set the precedent for his continued practice today. Magee is an archivist both of the mind and of the world in which we live, and the pictorial language he employs includes things observed and imagined. His background informs his art making. He worked as an archivist for Robert Rauschenberg for eighteen years and before that, as a young adult, using a seismic truck in Laredo, Texas, recorded vibrations sent into the earth to collect data about underlying geologic formations. The structure of arranging information to be found in these professional and formative experiences nestles comfortably in Magee’s artistic practice; his works often resemble charts and graphs of collected information or tablets on which an arcane language is transcribed. Given the formal structure of Magee’s paintings, it can be difficult to resist the temptation to categorize and organize his work accordingly. Many of the paintings in Circa 1994 are painted on thick slabs of wood that Magee found, on the streets or in dumpsters in Brooklyn. He cut them down to roughly the same size and covered them with simple images using irregular and thick applications of paint. The earliest of these record archetypal forms, such as birds, arrows, letters, numerals, trees, meandering paths, and crescent moons. Magee renders recognizable forms as purely abstract, while simultaneously conjuring charms and talismans of a personal nature. 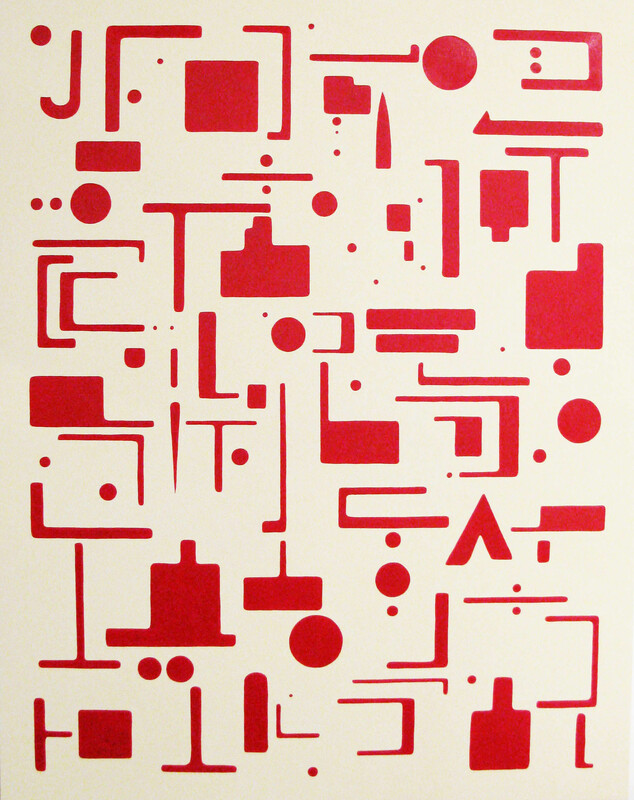 Red M, 1994, for example, can be read abstractly as three black triangles on a red ground or, alternatively, as the letter M, which is most likely a reference to the artist himself. Crescent moons are a predominant motif in a small group of paintings that develop one of the artist’s personal cosmologies. Magee often repeats the crescent shape in succession, creating a rhythmic vibration that pulsates visually. Djinn and The Sound in My Head, both 1994, appear to describe implicit life radiating from within figurative or totemic forms. Alpha II, 1995, is pure hard-edge abstraction, but it also resembles tally marks of the passing of time—many moons. In the late 1990s Magee began to organize numerous and varied forms within a painted ground. Usually arranged in rows and columns, Magee’s shapes are both familiar and foreign; they are modernist pictograms that can be read from left to right, top to bottom. The modest scale and hard surface of these works reinforce their relationship to written language—they become tablets, pages, or stelae. Magee came to Houston with Rauschenberg in 2007 for the opening of the latter’s Cardboards exhibition at The Menil Collection. It was at this time that Magee and I met, and I became familiar with his work shortly thereafter. Circa 1994 is our third solo exhibition of Magee’s work. Our first two exhibitions surveyed recent paintings. I became aware of his earliest paintings in 2011, when Magee was relocating works from a storage space to his Tribeca studio. Reassessing artworks that had been unseen for years, Magee arranged them on the floor of his studio and sent us a snapshot. Here was a mature body of work from twenty years ago that captures the artist’s visual, conceptual, and historical trajectory. Taking a cue from his arrangement on the floor, we installed Circa 1994 in a cluster: a colorful paragraph of Matt Magee’s visual language.